* If using an iPhone, make sure iCloud Drive is turned on under [Settings] > [(Your Name)] > [iCloud]. In Cateye Cycling™, tap (MENU) > [General] > [Backup], and then tap [Backup]. Backups are created in iCloud Drive on iPhones, and Google Drive on Android smartphones. In Cateye Cycling™, tap (MENU) > [General] > [Backup], and then tap [Restore]. The activity list at the time the backup was created will be restored to Cateye Cycling™. Try the following methods if pairing cannot be performed using the procedure in “Pairing a smart computer with a smartphone”. 1. On the measurement screen, press MODE for 1 second to display the smartphone search screen. 2. On the smartphone, tap [Bluetooth] under [Settings]. If [Bluetooth] is turned OFF, turn it ON. [CA:##:##:##:##:##] will be displayed if the smart computer is detected. Tapping will cause [CC-SC100B] to be displayed as the device name. 4. From (MENU) at the top left of the screen, turn on [Connect] and tap [Device]. Tap [Pair to Device] to start pairing. When Cateye Cycling™ detects smart computer, a message is displayed on the smartphone. Tap [Pairing] to complete pairing. On the measurement screen, press MODE for 3 seconds. Difference between "finishing a trip" and "completing measurement"
What does "finishing a trip" mean? • "Finishing a trip" refers to resetting smart computer (by pressing MODE for 3 seconds). This action resets measurement values to 0 and changes the screen to the "ready" display. You can then start measuring your next trip. What does "completing measurement" mean? • "Completing measurement" refers to saving and uploading a trip or a series of trips from the save & upload screen in Cateye Cycling™. You can do this by tapping (Flag) on the trips screen in Cateye Cycling™. Why is data sometimes not saved as summary data even after a reset operation? • Measurements for trips of 0.1 km or shorter are not saved as summary data. Why can't I upload activities to a service site? • Have you completed login settings for each service site? From Cateye Cycling™, tap (MENU) > [Account], and then complete login settings by entering account information for each site. Why does my smartphone battery drain so quickly? Have you been leaving [Connect] turned on in Cateye Cycling™ even when you are not performing measurement? • It is recommended that you turn off [Connect] from (MENU) to minimize smartphone battery drain. The firmware cannot be updated after "The update failed" is displayed while updating the smart computer's firmware. ​Formatting will delete all data and reset the smart computer to factory default settings. 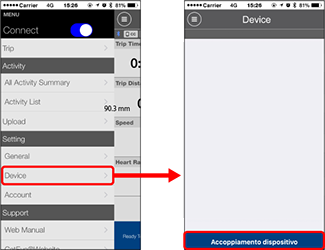 If the smart computer contains summary data measured in Sensor Direct Mode, import the data to the smartphone before doing format operation. 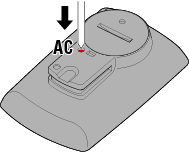 The following procedure explains how to format the smart computer. 1. Press the AC button on the smart computer. The initialization screen is displayed. 2. Press MODE once to cause [FORMAT] to blink, and then press MODE for 1 second. Smart computer will be formatted and the display switches to the smartphone search screen. Connect to the smartphone, and then try updating the firmware again. Firmware transfer has failed and could not be completed. Tap [Cancel] under [Update Firmware] in Cateye Cycling™. Then return to (MENU) and turn off [Connect]. The action to be taken next will depend on the smart computer display. Exit Cateye Cycling™ once and restart the application. Follow the procedure below to format the smart computer. Connect to the smartphone and update the firmware again. If the firmware fails to update again, restart the smartphone and try again. ​ Why can't I add a mail account in Notification Setting? Did you sign up for an iCloud mail account (@icloud.com)? 1. On the iPhone, tap [Settings] > [iCloud], and turn [Mail] ON. Follow the on-screen directions to obtain a mail account. 2. In Cateye Cycling™, tap [Device] > [PADRONE SMART+] > [Notification Setting] > [Add Account]. Enter your mail address and password. Is two-step verification enabled for your Apple ID? If two-step verification is enabled for your Apple ID, mail accounts cannot be added to Cateye Cycling™. In a web browser, log in to My Apple ID and turn off two-step verification. Authentication security for Gmail has been strengthened. In a web browser, log in to Google, and go to [My Account] > [Sign-in & security]. Click [Connected apps & sites], and set [Allow less secure apps] to ON. ​ An offset route is displayed in the Cateye Cycling activity list. Is [Map Position Correction] turned ON? • In Cateye Cycling, tap (MENU) > [General]. If [Map Position Correction] is turned ON, turn it OFF. [Map Position Correction] is a function for correcting map position offsets in China. In countries other than China, turning [Map Position Correction] ON results in offset route positions being displayed in the activity list. Turning this function OFF corrects the offset positions. Copyright © 2018 CATEYE Co,.Ltd. After updating Cateye Cycling™ app, smart computer fails to reconnect to the app during the measurement. Smart computer reconnects to my smartphone only when Cateye Cycling™ app is active (running in the foreground). • Third-party sensors inhibit the connection. Delete the sensors with ( ) from Cateye Cycling™ (MENU) > [Device], and then pair them again. Smart computer turns off after displaying smartphone search screen. • Press MODE button for 1 second to search the device and reconnect. * Smart computer keeps measuring during this operation. After updating the firmware on an Android smartphone, abnormal operation such as continuous buzzer sounds when connected or continuous displaying of incoming mail notifications may occur. In such cases, perform the following to restart the Android smartphone. 1. On the Android smartphone, turn off [Bluetooth] under [Settings]. 2. Under [Settings], tap [Apps] > [All Apps]. 3. From the list of applications, tap [Bluetooth Share] to select. *If [Bluetooth Share] is not visible, tap [Show system] first. 4. Tap [FORCE STOP] under [Bluetooth Share], and then tap [Storage] > [CLEAR DATA]. 5. Finally, restart the Android smartphone. After restarting the smartphone, connect PADRONE SMART to verify that the symptoms have improved.